Last edited by KenC; Fri 08 May 2015 at 00:00.. It is the default Verdana font, but from Ken's foreign keyboard setting (Malaysia). Ken, do you use a different keyboard when you get the strange font? Just a guess on my part, but it looks like he was set up to use a double-byte-character set, normal in many areas where more pictographic characters are used, rather than even the extended arabic characters used in most English language. From what you suspected, it seem like my pinyin entry (Chinese character entry) is causing the problem. I'll dig further the next time it happens. Had a rush job to get out for a commercial contractor....20 wall appliques..18 pcs. 64.25"x16",2 pcs. 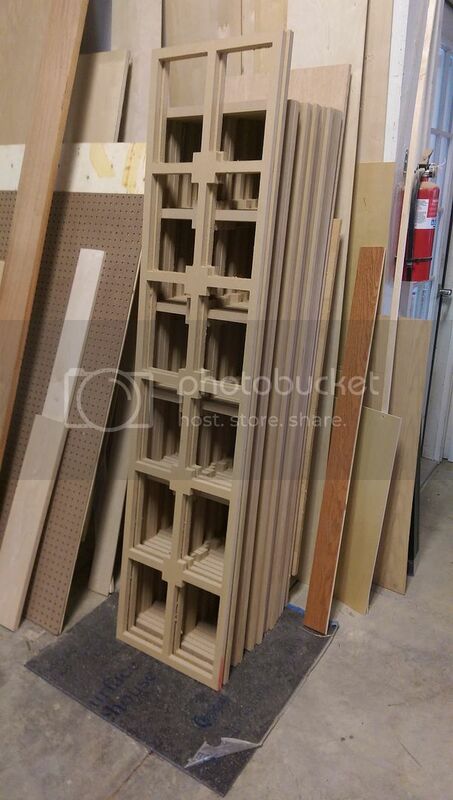 70.75x16"...out of 7 sheets of 3/4" MDF. 1/4" 2 flute downspiral, 10k RPM 120 IPM federate. All in all, exactly what the machine was designed for. How many passes? or did you cut the full 3/4" in one pass. Wall appliques, is that a fancy word windows ? Lots of cutouts to clutter up the shop. 1/4" cutter, 3 passes. The Milwaukee router doesn't have the brawn for a single pass. I like to limit cutter depth to equal or less than diameter. Just what works well for me. 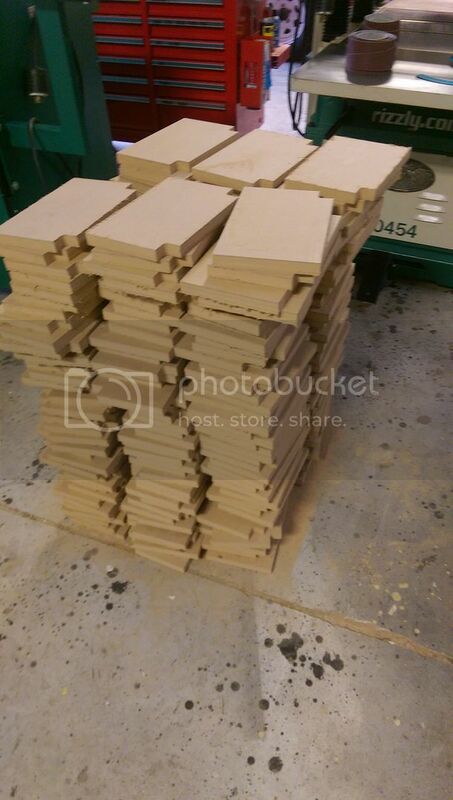 120 little blocks to clutter the dumpster today, Al. I actually kept 60 of them at the last minute, for that very reason. Posted a preview of one on my FB page, and sold $100 of v carved name plaques yesterday. Last edited by darren salyer; Tue 19 May 2015 at 06:21..
Darren... Read through your thread. Great build and amazing thread. Really appreciate all the photos and documentation before and after. I'm planning a similar build. x = 62 y = 120. Do you think the shaking you mention early on after completing the build is because of the minimal lateral bracing in the x to accommodate material storage? What would you tweak about your frame design if you were to do it again? Any surprises by building the gantry extra wide? Appreciate it! I have an overabundance of bracing in the X direction. I'll assume you mean the Y. This machine has a ton of mass. the legs and all the structure under the beams are 3/16" wall. Feeling the machine shake is different than having something show up in a cut. It cuts rock solid with no perceptible flex. My only change would be to use thinner wall gantry beams, with a bolt strip inside, to reduce the weight of the gantry. I don't believe that would decrease cut quality, and may allow a small speed increase. Temper that with the fact that I believe 120IPM is the limit of my cutters, (mostly 1/4" and 1/8") and router HP. On the rare occasion I use a 1/2" bit, I use 150-165 IPM speeds, which the machine handles with ease, with no lost steps. You need to make the jump to a spindle someday Darren. I have been waiting for that report. Me! Me! I want a laser too! Lol. How about we take up a collection for #101s member requested upgrades? Was it this forum where someone posted a link to a DIY diode laser made into a bracket that mounted to the router housing? A little CNC machine to laser burn. Ripe to take the laser and power supply to hack for mounting on the MM! I'll look into that one Jack. Heres the one I was thinking of. I remember seeing that one some time ago. Just never found a laser similar to what he used. Laser only machines can be much lighter because they have almost no mass required in the heads. Some just carry mirrors but from what I read they can be pretty hard to align. So for me, mounting a LED laser directly on the head is worth the little extra heft required. 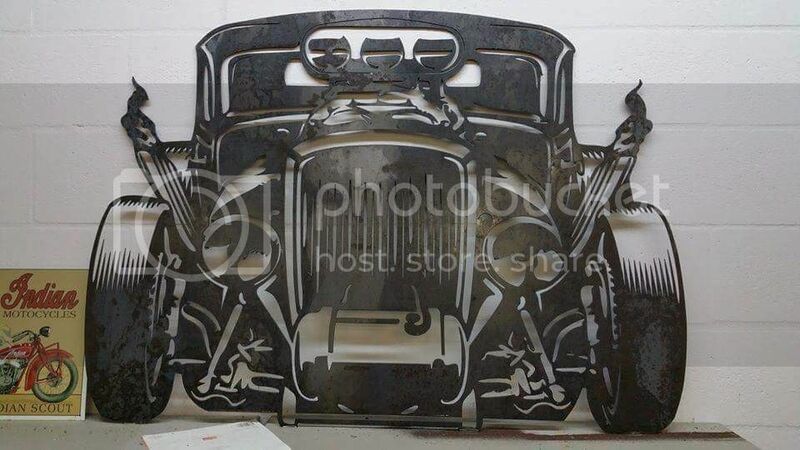 A few posts back, I mentioned cutting plaques for a guy with a plasma, of course, he sent me a pic of his most recent cutout, and I had to have one for the shop wall, in 14g. steel. 48" wide... I think its cool. Jack, that seller has a slightly more powerful Infrared Laser for the same price...Know anything about the difference between that and the one he used?